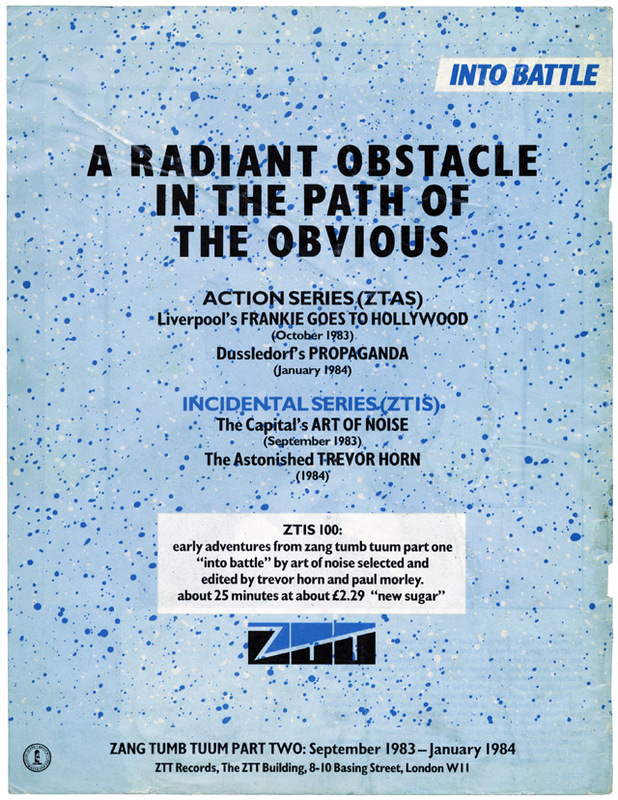 artist: Various title: A Radiant Obstacle In The Path Of The Obvious format: Blitz 1pg advert design: XLZTT photography: n/a cat. no: n/a date: 12/83 art of notes: notice that it mentions ‘selected and edited by Trevor Horn and Paul Morley’ in relation to ‘Into Battle’. I think ‘The Capital’s Art of Noise’ is definitely ‘Into Battle’ – OK so it came out in October not September but this ad would have been created and placed with the magazine in advance and maybe the timing was off. ‘The Astonished Trevor Horn’ i’ve always taken as an unrealised solo project from Trevor. Somewhere back in the mists of time I read an article which talked about a concept album Trevor was planning that took place inside a TV set – maybe that could have been it? Oh would love if you could find that article. I seem to also remember him talking about an Elvis Presley remix / mashup? he couldn’t get sample clearance on…but alas, I can’t find that article either. 🙂 Maybe it was related to that.